In 2016 an extraordinary discovery quietly took place along the city walls of ancient Ashkelon in modern day Israel. 211 graves of ancient Philistines were unearthed, the largest cash of Philistine bodies ever found and the only Philistine graveyard discovered thus far. Even after 30 years of excavation in Ashkelon much of Philistine life remains a mystery. Their bodies hold even more questions than they answer as the Philistines had unique burial practices found nowhere else in the Semitic world. One of the most striking elements was the discovery of small jugs of perfume placed under the noses of the dead. Why are they there…well it’s a bit of a mystery. To call someone a Philistine, even today is seen as an insult. That is mostly due to the depiction of the Philistines in the Bible. In probably the best example of history being written by the winners, the Philistines are depicted as baby-sacrificing, ark-stealing, war-starting, uncircumcised pig-eaters in the Old Testament. Two of the most famous Philistine characters are Delilah (the duplicitous seductress) and Goliath (a literal giant bloodthirsty man-monster). Were the Philistines these war-like brutes? Well, there are non-biblical sources from the Egyptians to Chaldeans confirming conflicts with the Philistines, but that doesn’t tell us a lot about them, and it wasn’t unusual for the period. Who were the real Philistines, well we really don’t know a whole lot. See, we don’t have much in the way of written history from the Philistines themselves. The Philistines were first recorded by others between 1185-1152 BCE. The Peleset, as they were called by the Egyptians, were first depicted as captives on a wall relief at Medinet Habu during the reign of Ramesses III. The Peleset were one of the several groups commonly referred to as the Sea People that were part of a serious of events that lead to the Bronze Age Collapse. Peleset captives at Medinet Habu with their distinctive headdress and kilt. The Bronze Age Collapse was perhaps the worst event in human history, and most people have never heard of it. Picture the end of the world directed by Roland Emmerich but set it in 1100 BCE, it was basically like that. While there is still a lot of debate on how and why the BAC occurred, there are a few things we do know. Firstly, the environment changed. After several centuries of temperate wet climate, Anatolia, Greece, and the Levant began a dry period. Ancient peoples didn’t have the luxury of crop reports and modern technology. They couldn’t respond to the changing climate fast enough. Years of consecutive drought led to severe famines from Macedonia to Babalon. Then there was a massive eruption of Mount Hekla in Iceland that was so powerful it affected the global atmosphere for 18 years and caused further cooling which exacerbated the famine, especially in Egypt and Canaan. The environmental catastrophe led to an economic disaster. Palace Economies were the centralised economic structure used throughout the Eastern Mediterranean. While Palace Economies were a major motivating force behind the construction of cities, and the building of Bronze Age empires, they couldn’t support the population in times of emergency. Except for Egypt and the Assyrians, after their retreat from Babalon, all of the Palace Economies collapsed. ALL OF THEM! That is like The US, Canada, and every country in Europe going bankrupt on the same day and the idea of money becomes worthless. This was so devastating in Greece that it took 400 years to recover; plunging the Hellenistic world into a dark age. Oh, we aren’t done yet kids, the chaos train hasn’t even left the station. After all that, the mighty Hittite Empire that led the world in the adoption of iron weapons suffered two monumental defeats that decimated the army. The Hittite collapse created a power vacuum that plunged the region into chaos. Between fights for limited resources, food, and dominance, the Eastern Mediterranean exploded into non-stop conflict. The Hittite’s secret weapons, iron, advance throwing spears, and better chariots were now up for grabs to whoever could get their hands on them. Keep in mind that most other communities were fighting with rattan shields and two swords because at least one would bend, break, or blunt by the end of the fray. Now here comes half-starved former soldiers riding on chariots, hacking with razor-sharp iron axes and killing foes 60 meters away with a toss of the spear. It was like bringing a hydrogen bomb to a knife fight. The fighting got so bad that almost every archaeological site in the Easter Mediterranean has a matching charcoal deposit from all the cities burning during this time. Some of them were set alight multiple times in this period until half of the Bronze Age cities were abandoned and people retreated to small rural villages. The last push before the complete societal collapse of the region was the Sea People. There is a lot of controversy over who the Sea People were. We call them Sea People because that is what the ancients did. They were people from Greece, Sicily, and Anatolia fleeing conflict and raiding for food. The Egyptians identified ten ethnic groups as raiders and pirates that came ashore to plunder during this tumultuous time. The Peleset were one of those people. There were opportunistic mercenaries and desperate people willing to take on the greatness of Egypt, but it was probably more complex. There were certainly also refugees looking for safety. There is growing scholarship (that I think has merit), which supports the idea that the Philistines were not a solitary ethnic group but a confederation of people thrown together by difficult circumstances that eventually became a unique group. Their material culture shows signs of Anatolian iron working, Aegean pottery making, and Cretan writing systems. After Egypt had repelled them, the Philistines settled in the area of the modern-day Gaza Strip. They possibly were relocated there by, or with the permission of, the Egyptians. However, once they settled they quickly adopted Semitic writing and Canaanite gods. This seems a strong case for a blended community that actively sought to adapt to a new environment. So our scrappy band of survivors settled and set up a pentapolis of five interconnected cities states: Gaza, Ashkelon, Ashdod, Ekron, and Gath. They adopted the Canaanite pantheon and worshipped Dagon as their primary deity. For a group that was struggling to survive in the face of massive famines and conflict, the god of fertility, grains, and domestic harmony must have been profoundly appealing. It is a Dagon temple that the Philistines take the Ark of the Covenant. It was the pillars of another Dagon temple that Samson pulls down. This all seems like a lot of information about the Philistines, but we know a microscopic amount about their day-to-day lives. For instance, historians know little about their language or social structure. We know they ate pigs and dogs, but we don’t know what else they ate. The Philistines did have reinforced city walls, iron weapons and engaged in routine combat with surrounding communities. They also intermarried in those same communities on a regular basis and maintained trade relations. They had rulers first called Lords and then Kings, but we don’t know how those leaders were chosen or why their titles changed over time. They worshipped Dagon as a primary deity, but Ba’al and Astarte were also influential. How did their religious practices differ from other Canaanites? What was their cosmology? Why were their burials so different from other Dagon-worshipping tribes? History hasn’t revealed this information yet. That is why this archaeological dig in Ashkelon is so important and why these little jugs of perfume matter. While the Philistine’s clearly adopted some aspects of the Canaanite culture, these are not Canaanite graves. At the time both Canaanites and Israelites practised secondary burial. In secondary burial, the body is placed in a temporary grave, often a cave or rock-cut tomb, to decompose. Once it is reduced to bones, the body is moved to a centralised familial grave. This practice remained in the region until the fall of Rome. The Philistines were evidently buried just once and with grave goods including food and drinks. Some historians speculate that the food was for their journey into the afterlife, while others think it was for placating restless spirits from harassing the living. The Israelites wrote that the Philistine’s sacrificed their children. This may have happened, but we also see the graves of children with their hands lovingly folded and a layer of broken pottery meticulously arranged over their bodies. That complicates the one-dimensional villains of Scripture. The perfume provides a fascinating insight into the values and myths of the Philistines. Perfume is a common grave good in cultures around the world, but I have never seen it placed under the nose of the dead. This wasn’t for scenting the burial, it wasn’t a store of perfume for the afterlife or merely the dead person’s possession; these jugs seem to be expressly for the olfaction of the dead. We can currently only speculate on what this means. Perhaps the perfume was to comfort the soul in its transition from life to death or to purify the person? Maybe they believed the dead were capable of olfaction and this was a way to keep them from experiencing the indignity of decomposition? The individuals in the Ashkelon graveyard died during a relatively prosperous time for the Philistines, 200 years after the collapse but what did they do about the perfume in times of emergency when resources were scarce? Could this burial step be skipped or was it of paramount religious importance? Apparently, scent mattered to them and was a part of their death rituals, but we are still missing pieces of the puzzle. There is still so much we don’t know and so much work left to do. The bodies and grave goods are currently being analysed. 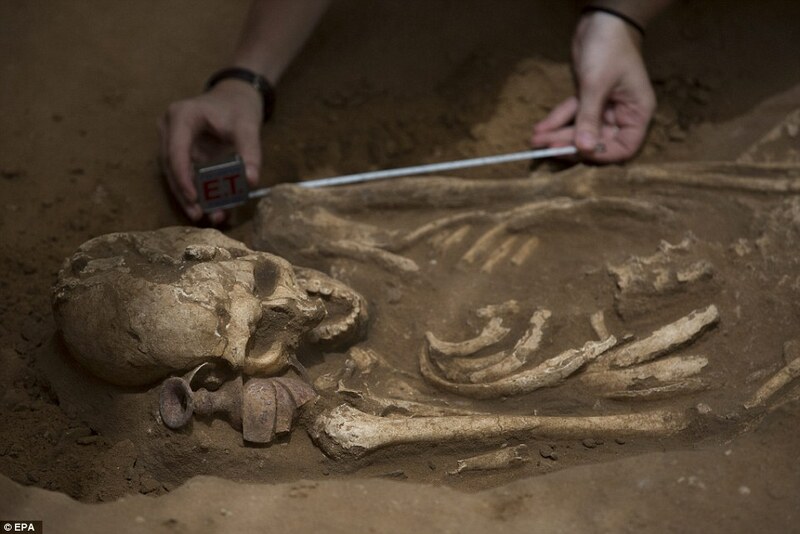 Hopefully, genetic testing can give insight into the Philistines origin. Analysis of the jugs and perfume residue may help us better understand the death practices of this group and in doing so help us understand what they valued in life as well. 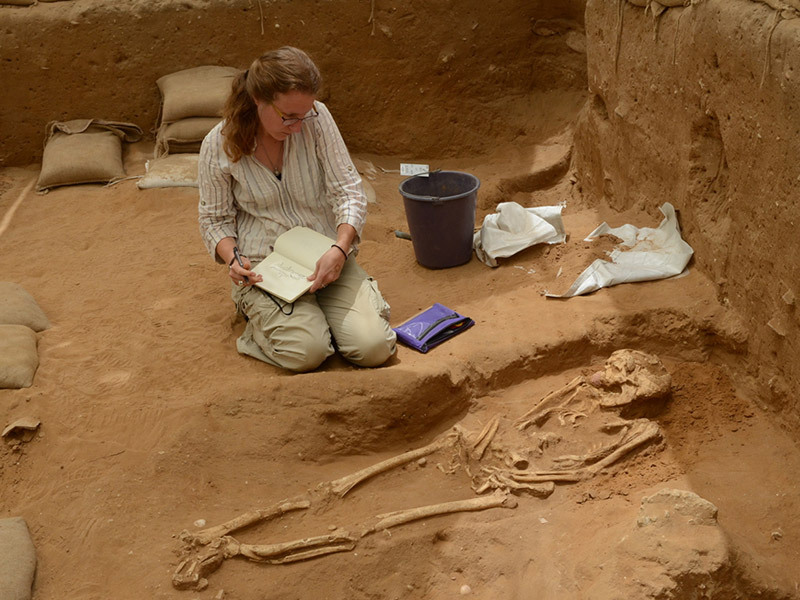 The team of anthropologists working at Ashkelon have been there for 30 years and will most likely be there for 30 more trying to unlock the secrets of the past. When people tell you there is nothing left to discover and we know everything there is to know, remember those little jugs of perfume.